We’re fond of BMW’s newest 5 Series here. It’s such a great all-around car, which is really the whole point of a 5 Series. It’s comfortable, incredibly luxurious, fun enough to drive and packs all of the latest technology. But the best body style of the new BMW 5 Series is the Touring model (wagon, in BMW speak). BMW has recently launched its 5 Series Touring and, as a do-it-all vehicle, it’s almost impossible to fault. It looks great, with Mat Watson claiming it to be better looking than the sedan (to which I personally agree with), has a superb cabin, the latest tech and impressive driving dynamics, all while being far more practical than the sedan. The rear trunk isn’t quite as large as in a Mercedes-Benz E-Class, because of the fact that the rear tailgate design is a bit more aggressive, eating into cargo space. It looks good this way, but makes it lose some extra storage. No matter, though, as it still packs a ton of usable cargo space and BMW is the only wagon in the class to have its rear glass open independently of the tailgate. From the driver’s seat, the BMW 5 Series Touring is smooth, comfortable and luxurious. The suspension just irons out bumps and is one of the most comfortable cars in the class. Though, it never feels floaty or soft, always buttoned down. It might not be as comfy as the Benz, but it’s damn close and more planted, for sportier driving. It’s also impressively quiet on the inside, with very little wind or road noise making its way into the cabin. This ends up being a bit of a downfall, though, as it’s so quiet that BMW has to pump engine noise in though the speakers to make it feel sporty. While that’s not so bad in an M5, because the engine is a big, powerful V8, it sounds weird in a diesel 5 Series. On the outside, you hear the diesel rattle but on the inside it sounds like a V8. That makes it seem too fake. When it comes to actually driving it, though, the 5er Touring is a great car. It may not be the last word it purity or feedback but it really is a fun car to hustle. I know we’ve heard numerous reviews about the 5 Series lacking the connection of older BMWs but when driving it, it’s hard to complain. It steers sharply and accurately, the front end is easy to place where you want and the chassis responds perfectly to inputs. It is by no means a bad handling car. Is it a bit isolated? Sure, but that’s sort of the segment, isn’t it? 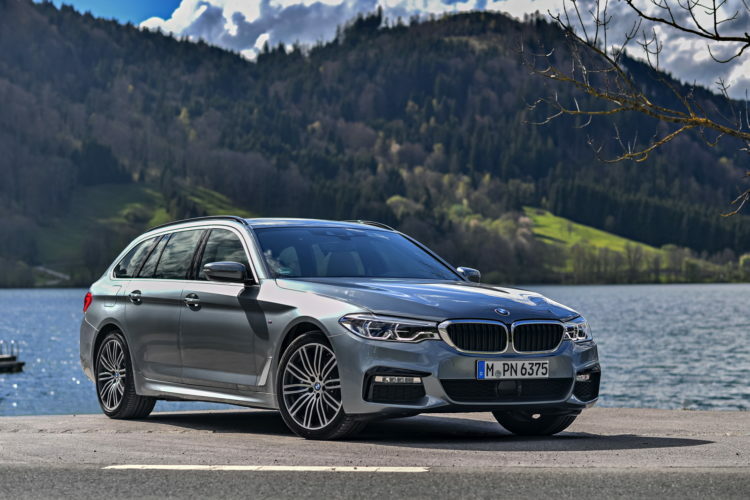 Overall, though, the BMW 5 Series Touring is a great car to own and driver everyday, as it allows for superb comfort, impressive cargo space and fun-to-drive capability. Now let’s just hope there’s a BMW M550i Touring in the future.